Yeah! It's Vintage time at Tammy's Scrappin Corner! We also are being sponsored by one of my favorite Digi Companies, A Day For Daisies. Show off your newly inspired vintage creations with us for a chance to win some awesome digi's! These two lovely ladies are my Grandmother on the left and her sister on the right, circa early 1940's. Aren't they beautiful ? The digi is called "Picture Perfect" and her pose was so reminiscent of the ladies in the Graphic 45 Curtain Call collection that I was compelled to break into my stash to use it! Of the old tune "You ought to be in Pictures". http://www.stephanie-whimsicaldesigns.com/ - Song inspired "You ought to be in Pictures"
Thank you for stopping by this week, I will be offering blog candy shortly so if you are interested be sure to subscribe so you will be notified...it's gonna be a big package as I have lots of double ordered (on accident) goodies to offer a lucky subscriber! An awesome vintage creation. Love the filmstrip with the stars of days gone by. 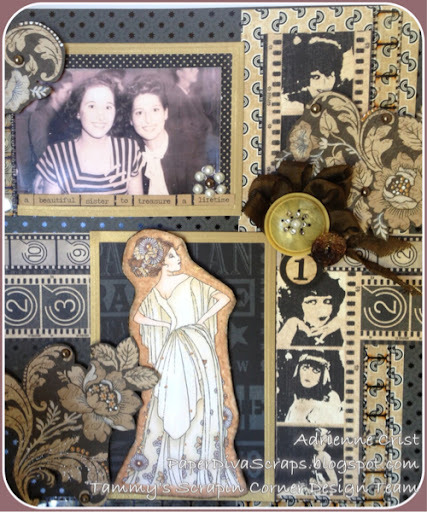 Adrienne this is such a gorgeous layout, a beautiful photo of your grandmother and great aunt & a fabulous choice of embellies. Thanks for joining us at Child's play challenges. Wonderful! Like how you used the image. Thanks for joining us this week at A Day for Daisies. Lovely! Thanks for playing along with the Fairy's Challenge. Thank you for joining us over at the Lacy Sunshine Challenge. Gorgeous old photo. You've scrapped it well. Thanks for linking up with us at Use It Tuesday. Gorgeous layout, love the papers. wonderful page and great details!!! thanks sooo much for joining us at Child's Play Challenge blog..
this is great! What a great way to highlight such a wonderful photo. Thanks for joining our AG challenge at Use it Tuesday this week. This is really a beautiful layout. Thanks for joining us at SFTW. Wow, what a beautiful LO! Great take on the song inspired challenge, thanks you for joining us at WD!